This version has special protective mantras on the rods to deflect negativities and neutralize evil energy. It has altogether 6-hollow rods made according to Feng Shui principle and dimension. It is made from heavy brass, with a special wu lou (calabash) designed on the top side of the windchime to cure illness star number 2 or to absorb any other illness energy. Besides there is also a coin center piece that knocks the 6 hollow rods. Another coin is designed at the tail of the windchime to bring unlimited good fortune to households or any premises that hang this windchime. This windchime is used widely to cure the annual 5-Yellow and Illness Star 2. What Windchime symbolizes and how to place the object? Windchimes like baguas is a fundamental tool used in authentic Feng Shui. The advantage of a windchime is it can be use internally to dissolve shar chi. Windchimes are unquestionably the most powerful enhancer and cure for many Feng Shui situations. Windchimes are potent enough to maneuver and enhance chi wherever it is placed. They make a significant presence especially for those who do not want to spend too much money to modify buildings and large structures due to bad Feng Shui. Properly designed windchimes according to the rules of the nature do not invite ghost, but instead will chase away evil spirits with the tones of metal energy. 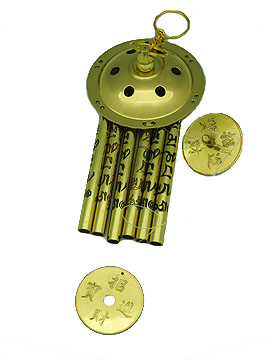 The proper design of windchime is important to ensure stimulation of good chi. Windchimes are made with 5, 6 or 8 rods, with each number representing hidden meanings. 1. 5 rods represents EARTH and attracts excellent chi and prosperity from 5 cardinal directions, namely North, South, East, West and Center. 2. 6 rods represents the "chien hexagram" from the studies of I-ching which carries the meaning BIG METAL and luck from heaven. Such a hexagram exerts the strongest form of metal energy which is required to counter problematic earth energy from flying stars #2 and #5. 3. 8 rods represents PROSPERITY BLESSINGS (fatt) and is the most popularly wanted number by Chinese. As an important rule of thumb, 5 & 6 rods are best to suppress bad luck and bad chi (curing purpose), while 6 & 8 rods are best to attract good luck (enhancement purpose). The 6-rods are also excellent cure for bad flying stars for those who practise Xuan Kong Flying Star Feng Shui. 1. 5-tiers Pagoda represents complete representation of the five elements, ie Metal, wood, water, fire and earth. It also represents the guardian of 5 directions by emperors. This leads to overall improvement of fortune and good luck, while overpowering or subduing bad luck coming from all the 5 directions. 2. 7-tiers Pagoda signifies seven treasures of Buddhism. It accumulates benevolance. It is also said to symbolize blessing from seven northern stars which brings ultimate wealth luck and career luck. 3. 9-tiers bring completeness and brings nobility, strength, good career, wealth and study luck. It also possess power to suppress bad luck and instability. In terms of materials, if the purpose is to enhance luck, one can choose windchimes that are made from the element which is similar to the element of the direction they wish to enhance. For example, enhancement in West, Northwest and North must have the windchime made by metal (Copper, Aluminium, Brass or Stainless Steel rods). Next, windchimes made of bamboo and wood are good as enhancers in East, Southeast and South, while windchimes made from glass/clay can be used in Southwest and Northeast. However, windchimes are normally used as cure or remedy for tough situations in feng shui and seldom for enhancement. And in generally, you should not be worried to use metal windchime in any direction as the significance of the presence of a metal windchime overides element clashes in any directions. This windchime design offered by Feng Shui Bestbuy is truly an ancient system with all the excellent qualities "all-in-one", used for centuries for Feng Shui purposes. They must be hung naturally in order for it to be activated. 1. Hang 6 rods metal windchime to dissolve 5-Yellow (bringing mishaps, fatality and accidents) and 2-Black star (bring illness). In 2012, the 5-Yellow is in the southeast and the 2-Black star in the north. They must be subdued in order to prevent fatality, bankruptcy and long term illnesses. 2. Hang a 6 or 8 rod metal windchime to enhance annual Purple Star #9 (for happy events, life expansion and promotion). In 2012, this future prosperity star which promises long term wealth luck resides in the northeast sector of your premise. 3. Acting as an alternative to bagua, 5 and 6 rods metal windchimes can also diffuse killing chi (poison arrows) from T-junction, lamp post, straight pole, tree and oppressing large building too close for comfort directly in front of your house. 5 and 6 rods metal windchimes can also remedy killing chi (poison arrows) coming from sharp angles, corners of buildings and roof ridges of your neighbours pointing at your front doors. 4. If your house has any external wall facing bad energy sent by highway, railway track and other oppressive structures, you may hang a few 5 and 6 rods metal windchimes along the wall to dissolve the shar chi. You are recommended to use odd numbers (yang) rather than even numbers (yin) for the number of windchimes hung along one wall at any one time. 5. Windchimes nourishes chi, and turns any harmful chi that enter our homes into good chi, through any entry points such as doors and windows without us knowing it. For this purpose, you may hang either the 5, 6 or 8 rods metal windchimes at the door frames at the sides and not directly at the center. c. You may display a 5 or 6 rods metal windchime in your bathroom to prevent any of your 8 aspirations being drained away (especially southeast and southwest). Windchimes are also excellent cures for bathrooms that are oriented in a wrong direction of your home, eg. they were positioned in ones sheng chi direction or good directions. d. You may hang a 5, 6 or 8 rods metal windchime at the end of your stairs to prevent wealth from rushing down towards your main door downstairs. 7. 8 rod windchimes will become a norm in households when period 8 comes in next twenty years (2004-2024). It will attract unlimited luck by activating good chi of period 8. Simply hang it in the NE to invite Period 8 energy into homes. 8. Now, you may also hang an 8 rods metal windchime in the west to activate children luck and northwest to activate mentor luck (so that you're never lack of support from important people who could bring you abundant opportunities). Defect rules built over time: They have high degree of quality gloss finish. But because they are held by tools and shaped through machining from blocks , there could be tiny tool marks or scratches visible under 30cm visual. Cast brass work experiences high heat process, gas defect, extreme shrinking and rough process steps, therefore they have "common irregularities" on their surfaces. They include blisters, bubbles, shrinkages, cavities, scratch lines, dents, tarnishes, dark spots, oxides etc. They are NOT considered as faulty and therefore are non rejectable. Despite obtaining from factories that provide high brass purity and the best in workmanship that supply only grade A pieces to us, common irregularities are still unavoidable. Note: Please do not hang a windchime directly above where you sleep, sit, eat, work or stand. Your energy will be suppressed. In the event that there is space constraint, you may hang the windchime lower than waist level.